Poor, beleaguered BBC. Only our Eton Mess of a Government would think it needs bringing down a peg or two. The rest of us (and much of the world) think it’s a bloody amazing institution that we’re all very lucky to have (much like the NHS, but that’s another story). My TV license is half the price of my basic Sky subscription but provides immeasurably more information and entertainment every month. However, this week’s online recipe debacle suggests what really needs overhauling is the management, not the website content. There seemed to be a complete absence of strategy behind all this. Might explain why some people thought W1A was a documentary. 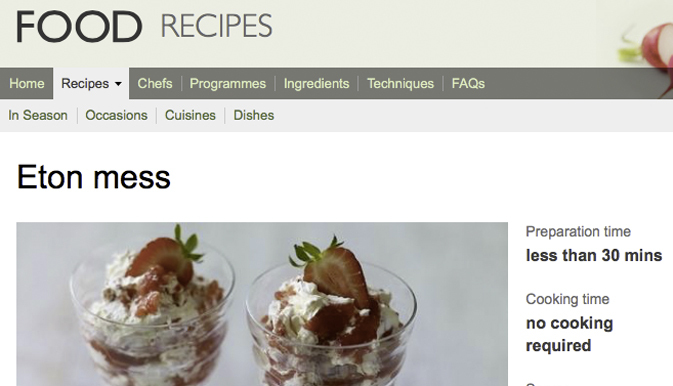 The decision to ditch 11,000 recipes from their website was a knee jerk reaction to the White Paper, which asked the BBC to be “more distinctive”, although this in itself is too vague an objective to be of any use. Clearly it won’t help save anything like £15m – if that’s the case, they really do need to get better procurement and IT people in sharpish. The BBC’s output is already very distinctive. From Strictly to Masterchef to Top Gear, it produces programmes that are sold and syndicated around the world. Far from being “obviously peripheral to what the BBC does”, as The Independent suggests, food and cooking is a major and much loved part of the BBC’s output, which absolutely delivers against its remit to Inform, Educate and Entertain. Last year’s final of Great British Bake Off secured 13m viewers – the most watched show of 2015 and more than double the ratings of that year’s X Factor final. Similarly, the recent Masterchef final scored 6m viewers, while over on BBC2, GBBO spin-offs Crème de la Crème and Mary Berry’s Foolproof Cooking regularly attract 3-3.5m viewers (more than Panorama). In the context of the obesity crisis, when schools and many parents no longer seem to think they need to teach their kids how to shop or cook, this resource provides a vital service. It offers tried and trusted cooking advice from the ‘everyday’ chefs (Mary Berry, Delia Smith, Nigel Slater) right through to the Michelin starred (Michel Roux Jr, Gordon Ramsey, Heston Blumenthal). So if these shows regularly attract the largest audiences and fulfil the BBC’s remit, why would their associated content be the first thing they drop? And why do they seem to have so little idea of its value? Rather than burying all this amazing content in the main website, its natural home should always have been BBC Good Food. As one of their few commercial sites, housing the content here could generate huge revenues for them. It should’ve been here in the first place, not moved in response to an online petition (160,000 signatures within 24 hours). So Tony Hall, James Purnell, Phillip Almond or John Shield*, if you’d like any help in turning this unscripted drama into a commercial advantage – do give me a call.